Una Paz Incierta: History y Cultura de las Comunidades Aguarunas Frente al Impacto de la Carretera Marginal. Centro Amazónico de Antropología y Aplicación Práctica (CAAAP), Lima, 1984. 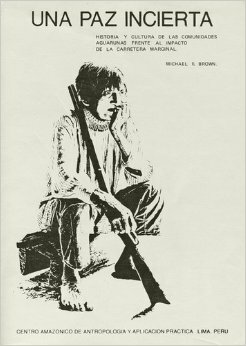 Una Paz Incierta is the first comprehensive ethnographic study of the Aguaruna/Awajún people, with particular reference to the Awajún communities of the Alto Río Mayo, Depto. de San Martín, Peru. The book describes their social and political situation in the late 1970s, touching upon everything from kinship and politics to ethnomedicine and shamanism. Now out of print, hard copies of Una Paz Incierta may be obtained from the author. A full-text PDF of the book is downloadable here.